We've been spending the vast majority of our time developing 3.0, but to keep the ball rolling, we've just put out Stencyl 2.2, a minor update that features a couple of the usability improvements that we have in store for 3.0. All of a game's settings are now housed in a single, easily accessible button inside the toolbar. Alternatively accessible from the View menu or as a keyboard shortcut. With this instant access, you don't have to flip away from what you're currently working on. We've also tweaked the organization of the settings to be more logical. Those who are working on both Web (Flash) and Mobile games now have a nifty dropdown menu in the toolbar to change their target, rather than going through the menu to do this. This makes even more sense in 3.0 when we add in the new platforms. - Controls Pane has been revamped in anticipation of supporting multiple keys. However, the current engine does *not* support multiple keys per control and will only honor the first one. - Fixed broken link to "Saving and Loading Games"
- Fixed issue with previewing atlases from Game Settings window. Let me be the second to say "rock on!" Found A bug when I tried to look at the newly added languages. It doesn't Show old languages options, only the newly added one and the default(which is the English). I can't wait to try out the *actual* multiple keys mapping! If it works as I think it will, and there's practically no reason that it wouldn't work so, then it'll be sweet! E.g. I'll be able to set the input for "Press [something] to continue" and other one for choosing one of a few options, which could overlap, while not being exactly the same. Apart from that, it'll make WSADing much easier. Looking forward to downloading. Is enable/disable behaviors fixed for iOS? when stencyl 2.3 is go? Hi, didn't know there was an issue with this? What problems are you seeing? Good update but I'm not sure about the new setting panel. 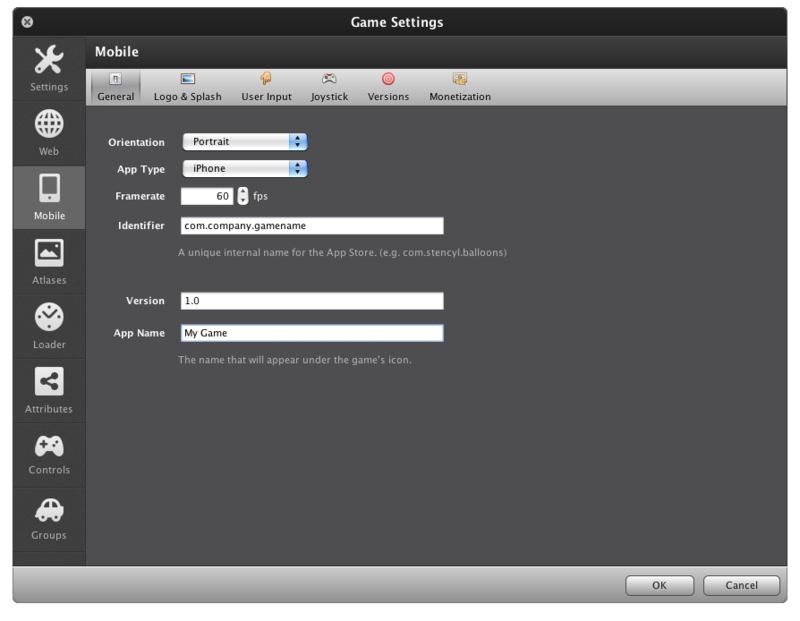 It seems more logical to have game attributes, groups and atlases in the dashboard rather than in the settings panel. Just one persons opinion though. In 2.0 and 2.1 the Enable/Disable Behavior blocks don't work. I've done a few tests, and unless I'm doing something wrong, they don't work. I'm sure I'm not doing it wrong, as I had them in 1.3.4, then when I updated to 2.0, they stopped working. It's a little disconcerting at first, because it's quite a change, but my first thoughts are that it's a good move.